Mercedes-Benz finally has a contender for the ever-expanding compact SUV market, and the competition will have reason for concern when the GLK350 4Matic becomes available January 2009. Styled with elements that have trickled down from the boxy G500, nee Geländewagen, favored by Prada-clad Hollywood types, the GLK is positioned as a crossover not just with style, but also substance. The GLK projects a Teutonic maturity and gravitas from its stern, utilitarian interior to its chiseled and boxy exterior. Pricing should start in the mid-$30,000 range, and the only powertrain available, at least initially, will be a lively but thirsty 3.5-liter V-6 mated to an all-wheel drive setup that yields 16 mpg city and 22 mpg highway. A clean diesel four-cylinder version will be optional only in Europe (at least for the time being), but we're betting that the U.S. market's V-6-only configuration won't be enough to keep devoted Mercedes fans away from the GLK. Mercedes-Benz's reputation for quality won't get tarnished by the new GLK350. From its buttoned down exterior to its tidy interior, the GLK looks, feels and drives like a robustly engineered package. The 268 horsepower 3.5-liter V-6 (also found in the SLK, E and CLK-class models) is well suited to the seven-speed adaptive transmission, and the burl walnut-trimmed interior is a pleasant place to wile away the miles. Though the GLK's road manners are generally well behaved, we wish the steering felt a bit livelier; transplanting the sporty SLK's optional direct steering system would do wonders to sharpen the handling. Also somewhat soggy is the GLK's tendency for fore/aft pitching during braking and acceleration—though road manners are otherwise commendable, it is an SUV after all. The experience behind the GLK's leather-wrapped steering wheel is largely satisfying. You won't get as commanding a view as you would from a larger SUV, like the GL or M, but that's not a bad thing, especially if you're averse to driving lumbering land yachts in today's downsized world. The GLK feels just big enough for a small family, but not bulky enough to be obtrusive. Visibility is good all around and the driver is treated to a decent amount of feedback through the steering wheel, though we detected some off-center numbness at times. Ride quality is generally smooth and Mercedes' Agility Control Damping system uses a passive valve system within the shock absorbers to stiffen the ride during cornering. 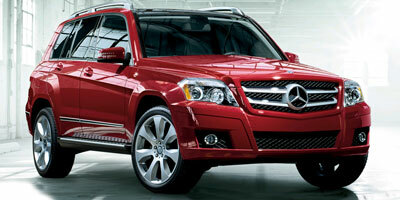 The GLK's well-controlled chassis negotiates its 4,036 lbs during hard cornering, especially when it comes to body roll. However, a bit of squat and dive rear their ugly heads when either pedal is pressed too hard. The GLK's 3.5 liter V-6 pulls strongly and is capable of reaching 60 mph in an estimated 6.5 seconds and hitting a top speed of 143 mph. The 268 peak horsepower figure is reached at 6,000 rpm and its maximum torque of 258 lb-ft is spread between 2,400 and 5,000 rpm. The engine's flexibility makes the seven-speed transmission somewhat redundant, though not quite as excessively as in the smaller and lighter SLK (or, say, Lexus' eight-speed gearbox.) Aggressive drivers may also be frustrated by the amount of time it takes for shifts to occur, even when it's not in "Comfort" mode. We're guessing when and if an AMG version of the GLK is released, it will feature a snappier transmission and price tag to match. If you’ve got an iPod, iPhone, Zune or virtually any other USB-based MP3 player, the GLK’s optional glovebox-mounted Universal Music Interface (roughly $1,600) enables full integration into the car’s stereo. The system can even accommodate wireless audio signals via an A2DP Bluetooth profile, enabling the tunes to be zapped directly from that cell phone in your pocket. Much like Ford’s SYNC system, the Mercedes UMI also enables music to be played from memory sticks. An optional Intelligent Light System uses five parameters—cornering, country, motorway, active and enhanced fog lamps—to control different lighting programs for different conditions. For instance, the car’s Bi-Xenon headlamps will swivel outward in fog lamp mode in order to aid visibility, and the cornering mode helps at intersections or tight bends. The GLK offers enough tech features to make your life simpler, without distracting you with too many bells and whistles. A knurled aluminum wheel on the center console controls the GLK's audio and navigation system and while it's still not as intuitive to use as the touch-screen systems found in some of the competition, the Benz solution is two steps above BMW's iDrive. The optional seven-inch COMAND navigation screen uses TFT technology for a clear display and the multimedia package enables CDs to be ripped to a six-gigabyte hard drive that can store up to 1,000 tracks that are automatically identified using a Gracenote database. Other options include Parktronic distance sensing, a rear entertainment system, SIRIUS satellite radio and an 11-speaker Dolby digital 5.1 sound system. Only available with a 3.5 liter V-6 mated to an all-wheel drive configuration, the GLK350 is estimated at 16 mpg city and 22 mpg highway. While we'd expect higher numbers from a crossover, the vehicle's two-ton curb weight is at least partially to blame for those figures. Since Bluetec diesel seems to be making it into most Mercedes-Benz SUVs, it's seems to us that it’s only a matter of time before it trickles down into the GLK. We personally can't wait. The GLK's five-passenger interior is a relatively airy, pleasant space with up to 65.9 cubic feet of storage when the rear seats are folded down. In typical Mercedes-Benz fashion, instrumentation is clear and no-nonsense and high quality materials are used throughout. However, you've got to pony up for real leather, or else you're stuck with vinyl, er, MB Tex. A smallish five-inch screen comes standard, though the optional seven-inch COMAND setup is much easier on the eyes. Externally, the GLK resembles a mini-me version of the XL-sized Mercedes GL-series, though this small sport ute's got a bit more of a boot-like silhouette. But that tall greenhouse enhances outward visibility, and its creased sheet metal lends it a look of purposeful intention. Chalk one up for originality; when the GLK rolls down the road, it won't be confused with its competitors any time soon. The Mercedes-Benz GLK350 is estimated to start in the mid-$30,000 range, a reasonable figure considering its quality construction and premium personality. Intended to battle the likes of the Acura RDX ($33,695), BMW X3 ($38,600) and upcoming Audi Q5, the GLK shouldn't have any problem attracting buyers with the Tri-Star on the front grille. Buyers of run-of-the-mill compact SUVs have long enjoyed tried and true options—think Toyota RAV4, Honda CR-V and Ford Escape—but the market for luxe ‘utes has only recently blossomed. Entering this growing niche has enabled Mercedes-Benz to take a gamble with the GLK and offer it with only one gasoline powertrain, whose fuel economy figures are not particularly outstanding. We think it’s a brash but perfectly viable move, especially considering the rampant fondness for the Mercedes-Benz name and everything it represents. The GLK offers a solidly constructed, strong performing alternative to the likes of Acura, Audi and BMW; it's an honest, straightforward vehicle that plays up the manufacturer's storied past while remaining technologically competent enough to attract younger customers. But only when Mercedes expands the powertrain options and offers something for more eco-conscious buyers will the GLK’s survival be ensured.